Do you love hot and spicy buffalo wings? 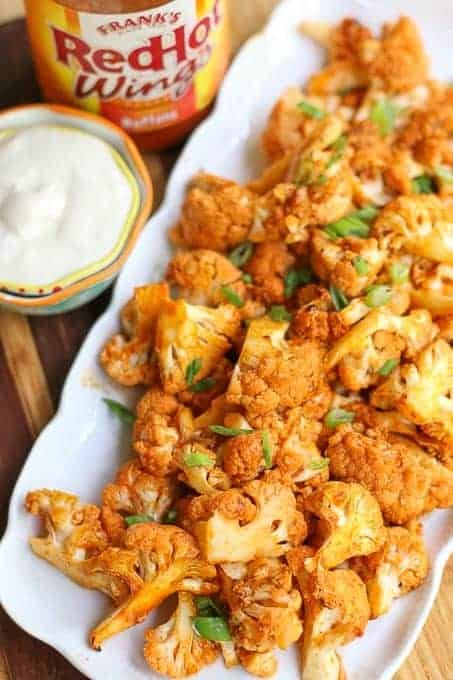 Then these Buffalo Cauliflower Bites are going to be your next favorite dish! These burn your mouth a bit bites are banging with flavor. Serve them as an appetizer or side dish; either way these tasty little bites will be a big hit in your kitchen! Just to name a few… It is a lovely menu and a great place to dine. Don’t leave without ordering the Prickly Pear Margarita, but be aware! One leads to two and you will need an Uber when you make it to three. One of the things we ordered were the lightly battered cauliflower fried in their “Heck” sauce. Basically they are gourmet buffalo cauliflower bites. After eating the batch, I knew I had to go home and create my own version. While I loved Cruz’s version, I didn’t want mine to be deep fried or battered, so I created this recipe. 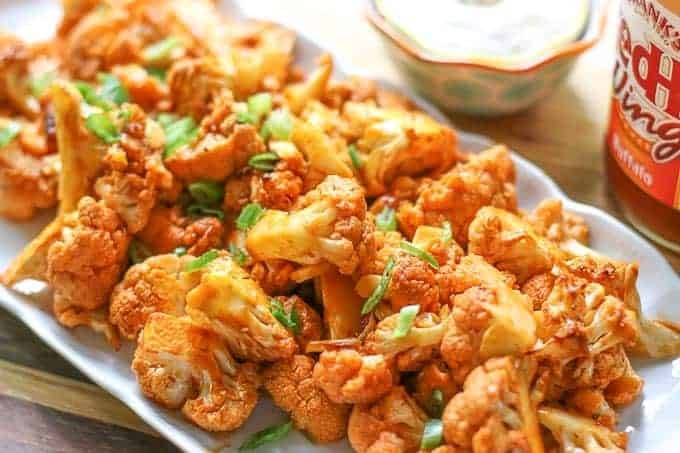 I have to say, these buffalo cauliflower bites are a party favorite among my friends. I have to at MINIMUM double the recipe when friends come over and I NEVER have left overs. When I am eating healthy, I will make a batch of this and pair it with grilled salmon for my husband and I. We literally will eat the whole head of cauliflower all to ourselves. This is saying a lot because we are not huge fans of cauliflower…. 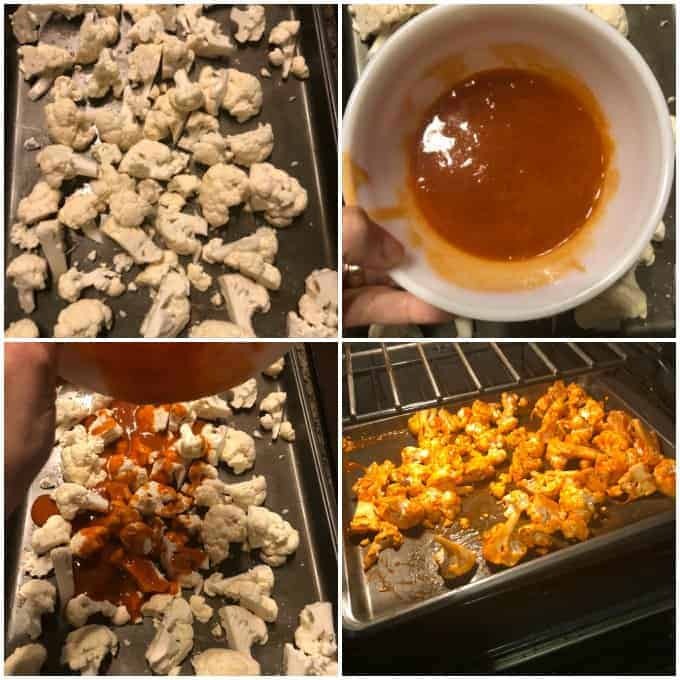 Making buffalo cauliflower bites is easy! Cut up one head of cauliflower and spread it out on a cookie sheet. Make the buffalo sauce (see recipe below). Oven roast at 450 for 20 to 25 minutes. How easy is that? If you like this recipe, check out: Grilled Buffalo Wings, Cheesy Buffalo Chicken Pie, Cheesy Jalapeño Cheddar Beer Bread. Cut up the head of the cauliflower. Mix together the remaining ingredients. 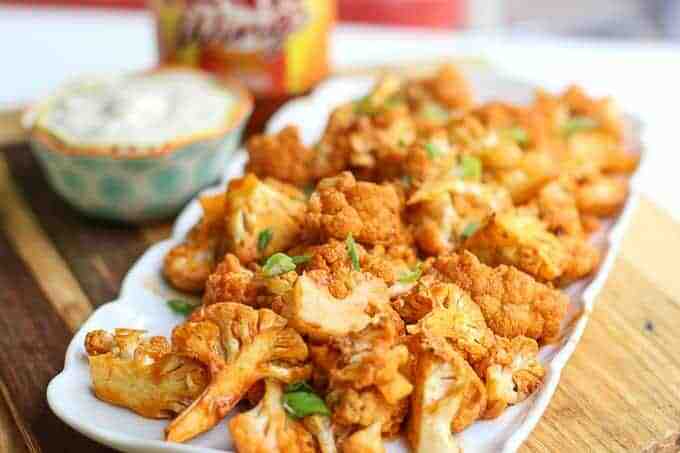 Toss cauliflower in sauce mixture. Oven roast for 20-25 minutes. So glad you enjoyed this. Thanks for sharing! Tried this and love it, will be my go to when I’m craving buffalo wings! 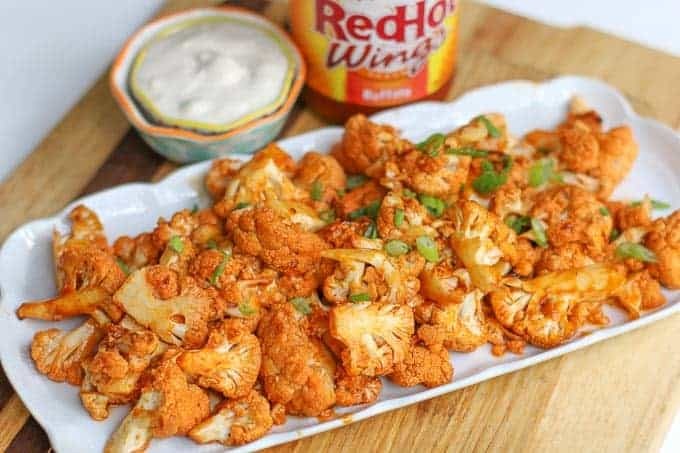 Love Frank’s hot sauce and love cauliflower bites! I’m pretty sure I could polish off that entire platter 😉 Delish! !